This post is a followup to a previous post . Not 100% sure they are the same spider, but I would consider something around 95%. It was on the same downspout as the previous post, just on the back side, between the spout and the house. It was also at about the same height off the ground. What gives me pause is that this one is missing part of its second-from-the-rear leg. If it's agreed that they are the same spider, and these extra images prove useful, I'll link them together. This first image is natural, showing the color, etc. 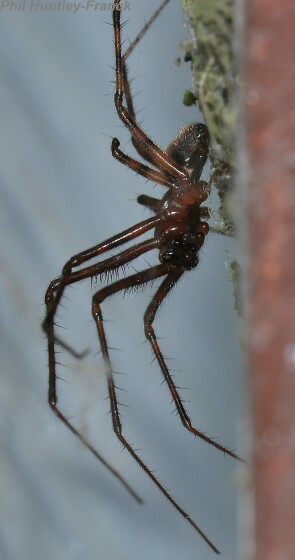 The second image has been lighting enhanced, to show more detail of the underside. The third image has been lighting enhanced even further. Hopefully the two enhanced images will allow the palps to be seen more easily.